Barry Morrow was fishing a tournament at Stockton Lake in Missouri, when he discovered a bass fishing finesse technique also triggered strikes from finicky crappie. …Morrow moves closer to the target and drops his rig straight down the tree trunk. Morrow would either pitch his rig to the trees to let it swing back to the boat or drop the rig next to the tree and let it fall straight to the bottom for a vertical presentation. “A lot of times when I would drop it straight down by the tree, I would just bounce the weight off the bottom and let it sit there,” he says. “I would then get a bite 8 to 10 inches off the bottom.” He believes the weight bouncing off the lake floor stirred up bottom debris and created a feeding response from crappie. The drop shot rig has now become one of Morrow’s favorite tactics to employ when he needs to try something different. Morrow dotes on fishing with jigs, but when the jig bite is off he switches to the drop shot. He also relies on the drop shot to catch crappie passed over by spider riggers. Barry Morrow vertical jigs a drop shot rig when crappie are holding tight to the trunk of standing timber. 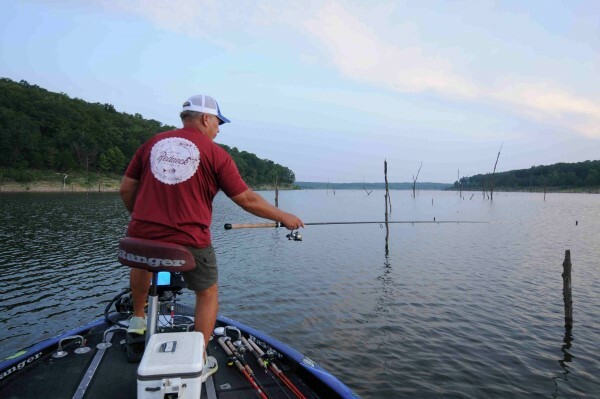 The drop shot rig is especially effective for Morrow when he fishes the cedar trees on his home waters of Missouri’s Truman Lake. “There is a time in the spring when the fish move off the beds and start transitioning to the wood,” Morrow says. He resorts to the drop shot when the fish are in the cedars because it allows him to keep his minnow or soft plastic lures tight to his line and makes it easier to bounce through the limbs or keep close to the trunk of the tree. Morrow starts his rig by tying a number 2 octopus, Aberdeen or Tru-Turn Aberdeen hook to his 12-pound copolymer or 15-pound braid line with a Palomar knot and leaves a tag line of about 8 to 12 inches. He then slips the tag line back down through the hook eye. “That keeps the hook lying straight from the line with the barb pointing up,” Morrow says. He completes his rig by tying on either a bell sinker or Bakudan weight to the tag line or crimps a split shot at the end of the tag line. The minimum size weight he usually uses is 1/4 ounce. The Missouri angler chooses either a Red Neck Rubber Company Beaver Bottoms Baits or Bobby Garland Crappie Baby Shad to attach three different ways to his drop shot hook. 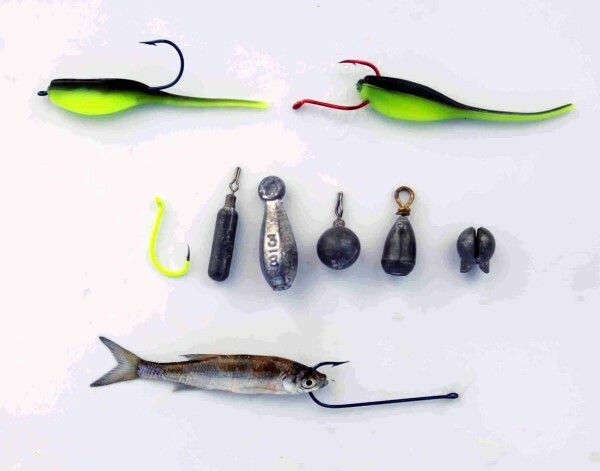 He either (1) nose hooks the bait on the octopus hook; (2) runs the Aberdeen hook through the lure’s body and sticks the hook point out the top of the lure; or (3) makes the lure weedless by sticking the Tru-Turn hook through the lure’s body and twists the hook to run the point back into the body. When Morrow fishes the drop shot with a minnow, he runs the hook through the minnow’s lips from bottom to top. Barry Morrow uses a variety of hooks and weights for drop shot techniques using soft plastics or minnows. When swimming the rig, Morrow never lets the weight hit the bottom. “If I am fishing 10 feet of water I am going to flip it down to about 4 feet under the water,” he says. While positioning his boat about 10 feet from his target, Morrow either pitches to the cover and swims his rig back through the tree limbs or drops his rig near the boat and “walks” it towards the trunk of the tree. If the swimming presentation fails to trigger strikes, Morrow moves closer to the target and drops his rig straight down the tree trunk. “I let that weight touch down on the bottom and bounce it two or three times there and then I am just going to hold it,” says Morrow, who usually holds it still for 10 to 15 seconds. 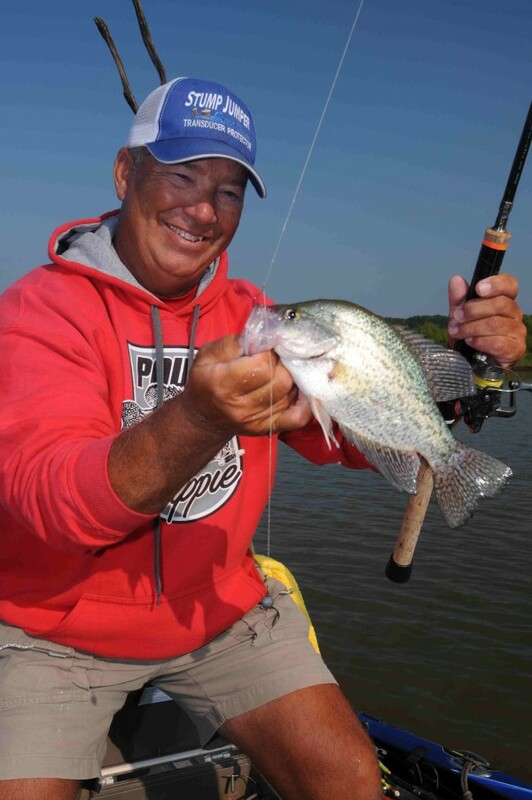 “A lot of my bigger bites come off the bottom.” If crappie ignore the still bait, Morrow slowly raises the rig back to the surface which allows him to fish different levels of the water column before trying a new spot. When presenting his drop shot to cover, Morrow depends on either a 10-foot Todd Huckabee Dipping Rod or a 10-foot, 7-inch Todd Huckabee Pro Series Rod. He matches the Dipping Rod with a Quantum spinning reel spooled with copolymer line and combines the Pro Series Rod with a B’n’M Buck’s Best Ultra-Light Reel filled with braid.